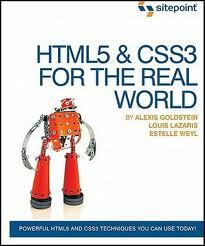 I’m currently reading a really good book – “HTML 5 and CSS 3 for the real world” by Alexis Goldstein, Louis Lazaris & Estelle Weyl. This book covers all the new elements that HTML 5 brings with it. Reading it made me realize how little I actually knew about the topic and frankly it’s not surprising since there’s a lot to know. In the next posts I’ll introduce all the new elements, their usages, supported browsers and best practices based on the mentioned book and different articles.